Home » social networks » Facebook Adds Organ Donation To Timeline: Should We "Like" It? Facebook Adds Organ Donation To Timeline: Should We "Like" It? Typically, I post on Wednesdays. However, with so much chatter about Facebook's announcement, this felt more timely. Starting today, you can add your organ donation status to your Facebook timeline using the "share life" tool. If you are already registered, you can share your story about where and why you decided to become an organ donor. If you are interested in registering, you can follow links to official donor registries. ABC has been a primary news source for this announcement, interviewing Facebook CEO Mark Zuckerberg, demonstrating how to use the "share life" tool, and discussing myths and facts about organ donation. Scanning Facebook and Twitter today (especially among my public health colleagues), the response seems to be overwhelmingly positive. From my perspective, the Facebook tool has the potential to be effective (i.e., increasing the number of registered donors) because it focuses on action. The tool is not for education. The tool actually links to registries so that you can sign up. The tool aims to increase the visibility of already registered donors, which in turn will influence others to sign up. The tool aims to decrease the stigma and secrecy of talking about end of life decisions by putting it right up there next to your birth date and relationship status. This may also influence others to sign up. In previous posts, I have written about public health campaigns that use social media in order to reduce the stigma around an "undesirable" topic (e.g., STD testing). "The company announced a plan on Tuesday morning to encourage everyone on Facebook to start advertising their donor status on their pages, along with their birth dates and schools — a move that it hopes will create peer pressure to nudge more people to add their names to the rolls of registered organ donors". I consider declaration as an organ donor to be a medical decision. In public health and medicine, we strive for patients and the public to make such decisions from a position that is informed and lacks pressure from physicians or family or friends. Therefore, I have reservations about people signing up without educating themselves first and/or because they feel pressure on Facebook. Just a few weeks ago, I posted about "hashtag activism" and how easy it has become to get involved in causes via social media. Are we as thoughtful when we participate in causes on Facebook as when we participate in real life? My other ongoing concern is regarding the proper security and use of personal information that is gathered by Facebook. Will your organ donation status result in particular advertisements being sent your way? I remember updating my Facebook status to "engaged" 4 years ago and being overwhelmed by the wedding planning advertisements on my page. There is increasing public outcry regarding privacy settings and the personal information you enter being used for Facebook to attract advertisers and other business opportunities. Again, I am 100% supportive of the organ donation mission. I think the reach of Facebook offers tremendous public health opportunities (including the possible elimination of long wait time for organs). While that is an attractive outcome, we must always remember to focus on the ethics of the process as well. Facebook has become directly involved with several public health issues (e.g., suicide, bullying, organ donation). Are their strategies effective? Why or why not? Do you foresee any unintended consequences from the organ donation tool? Will you include your organ donation status on your Facebook timeline? Why or why not? 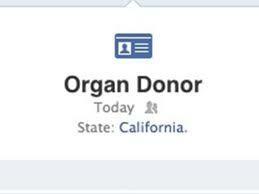 Related Posts : Facebook Adds Organ Donation To Timeline: Should We "Like" It?